Some authors love the revision process. Some, not so much. I fall in the latter group. But if there's one thing I dislike more than working on revisions, it's the idea of automating the process with software. Revisions aren't only about spelling and grammar. They're also about improving the flow of a story and making better word choices, even if your original is technically correct. 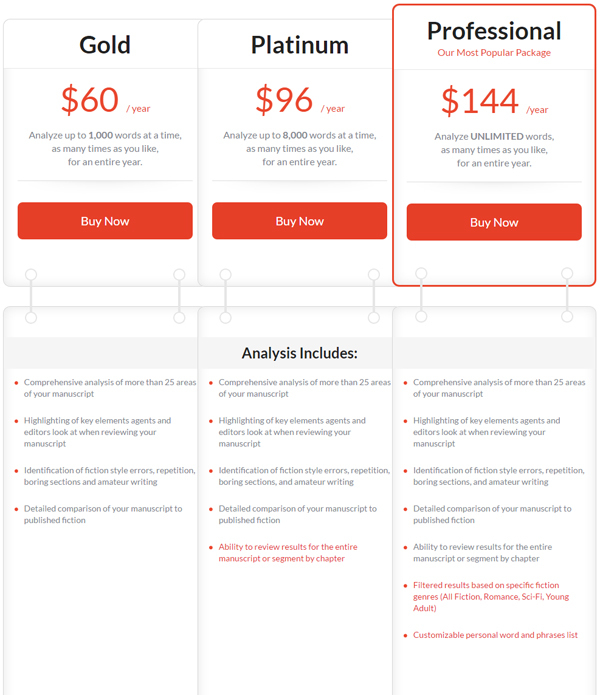 I have to admit I was skeptical when someone from AutoCrit contacted me asking if I'd like to review their online editing tool for authors. (Full disclosure: AutoCrit set me up with a free test account to try things out for this review.) But after using it for early revisions on some short fiction, I was pleasantly surprised. I think it could serve as a valuable self-editing tool for most indie authors. Even though AutoCrit is specifically for editing fiction, I think it would be beneficial when writing nonfiction articles as well. Let's look at some of AutoCrit's highlights and some areas where I think it could be improved. 1. The tool is easy to use once you get the hang of it. 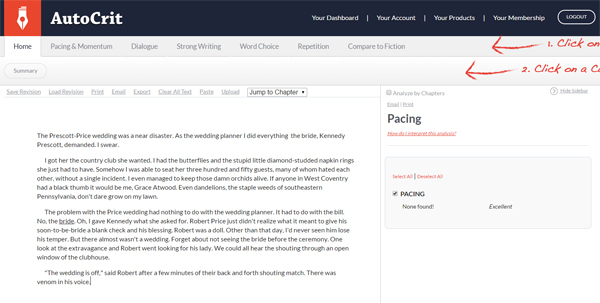 You can also choose to compare your writing to published fiction. Areas for improvement are highlighted in your text on the left of your screen. The right panel lists them, so you can view all problem areas quickly. 2. AutoCrit doesn't change anything automatically. Perhaps the best feature of AutoCrit is what it doesn't do. It doesn't make changes to your work, acting like the software knows better than you do as the author. If it had done that, I'd have no love for the tool whatsoever. But it leaves every decision in your hands, instead focusing on bringing potential issues to your attention. 3. AutoCrit can be tailored to you. 4. AutoCrit processes everything quickly. Most of the testing I did for this review involved running flash fiction through AutoCrit (good timing actually as the review request came in right when I needed to revise some pieces for the new flash fiction blog I launched at the end of March). Reports took almost no time to load, which I expected with stories of only a few hundred words. But to test it further, I pasted in around 50,000 words from a novel's first draft. To my surprise, AutoCrit processed reports on that just as fast. AutoCrit has a lot going for it. But to be fair to you, I think it's also important to bring up the downsides and offer suggestions for how the tool could be made even better. 1. Problem: When you paste text in, AutoCrit messes up the formatting a bit. AutoCrit seems to mess with your paragraph formatting when you run a report. Sometimes I saw paragraphs smushed together immediately after the text was pasted into the tool as well. But the biggest issue is that, after running a report, AutoCrit splices sentences, adding strange line breaks that you have to manually remove. 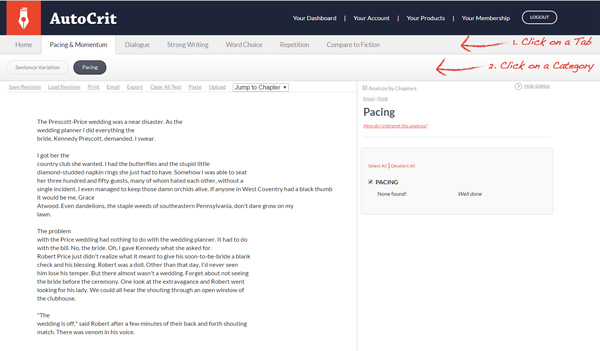 You can see what happened when I chose the Pacing report using some example text below. It's not a huge problem when you're working on flash fiction. But I can see this being a bigger problem if you're working on novel revisions. Update: I was contacted by Michael from AutoCrit with a workaround to the strange line break issue. It seems it's only a problem when you paste from Word directly into the text window. If you use AutoCrit's "Paste" link or upload your file instead, the line breaks shouldn't be added when you run a report. In my case, however, I had another issue where paragraph indentations were stripped out when using those two options, before running a report. But that probably won't be as confusing or as difficult to change when you export your edits. 2. Suggestion: Make AutoCrit more nonfiction-friendly as well. I understand that AutoCrit is for writers of fiction. But many authors also write nonfiction these days, even if it's only for their own blog posts. AutoCrit can already help nonfiction writers out a great deal, so it seems silly to me not to market the tool to them. As of now, the only report sections that don't equally apply to nonfiction writers are the Dialogue section and the "Compare to Fiction" tool. 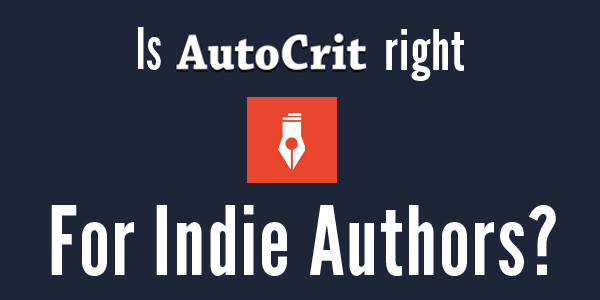 AutoCrit has the potential to be a great all-in-one self-editing tool for an ever-growing group of crossover writers who take on both fiction and nonfiction projects. A simple start would involve letting writers check a box to say whether they're currently editing fiction or nonfiction, removing the two fiction-specific sections for nonfiction writers. That alone would make it more marketable to nonfiction writers, while leaving room for later nonfiction editing enhancements, like AP style guideline suggestions for news pieces or "scannability" reports for bloggers (making sure you break up posts with headlines and lists). 3. Suggestion: Offer monthly pricing options. Right now, the only pricing options for an AutoCrit membership involve yearly payments. That's fine for authors on a regular revision schedule where they're always revising one project or another. But I'm going to make an educated guess here and say most authors aren't likely to fit into that group. Some authors only write and revise one manuscript per year. They might only need access to AutoCrit for a few months. Others write short stories and novellas where they might need the revision help during more sporadic intervals. And then there are first-time authors who might not feel comfortable committing to a tool like this over the long haul. They're still trying to figure out their process. While this suggestion would benefit those groups of writers, it comes more from my marketing and PR background as a suggestion in the company's interest. It seems that, right now, the AutoCrit folks might be pricing themselves out some fairly large author markets by requiring a yearly commitment. While there's plenty of room to improve AutoCrit, it's a great tool. I can't see how it wouldn't help most indie authors, as well as some freelance writers and bloggers if you avoid the fiction-specific reports. The cost is reasonable. It's easy to use. And it forces you to look at your work with fresh eyes by highlighting some of the problem areas you might miss because you know what you meant to say. That said, understand that AutoCrit isn't a substitute for working with a professional editor. No author is the best editor for their own writing. Neither is a tool like this. But it can help you push through the self-editing process to catch common problems before you send your manuscript off to your editor. What about you? Have you used AutoCrit? Love it? Hate it? Something in between? Share your thoughts with me in the comments. You can save 20% on your Professional AutoCrit membership by using promo code: AIW20. 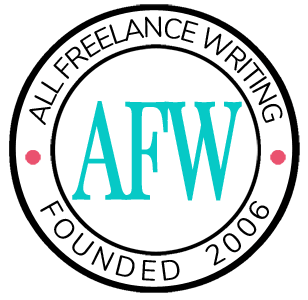 This discount for All Freelance Writing readers is available until April 30, 2015. Thank you for this great review. It looks like AutoCrit took your suggestion. The pricing has changed. Now its $29.97 a month. Frankly I would have preferred paying $60 a year or even the $144 a year for platinum. So now it is two and a half times more expensive than their former premium option. Although I agree that indie writers would prefer a monthly fee so we can opt out, they missed the boat if they think I want to pay 2.5 times the price for that convenience. Right now I find the price unreasonable. I think they need to add an annual option price that is more in line with the original price scheme. Yes, that certainly wasn’t what I had in mind. Letting people pay only when they need the service is a good thing. Increasing that monthly price so part-time users would end up paying what year-long users used to… that’s just greedy. While I liked the service when I used it, I certainly wouldn’t pay $24.95 per month. Not a chance. Thanks for the update on it. I wasn’t aware they’d changed it so drastically. They’d comped me an account at the time to get me to test it and do the review. It looks like that was still active, so I poked around. I did see some changes, but nothing to justify that big of a price increase. And I couldn’t even upload a document to test it out — not sure if it’s a broader glitch or if the previous reviewer accounts they set up in the old system just aren’t fully functional anymore. So yeah… disappointing to hear that about the price increase. Tells me they’re still missing the mark in understanding the buyers they’re targeting. The $144/year is now being called a special discount that I can use because I won NaNoWriMo this year, and they were one o NaNo’s sponsors. For exactly the reasons you stated $144/y is out of my price range, especially since I don’t think I’ll actually be ready to revise any of my half-finished manuscripts for A While And A Half, or so. altogether, I’m a little interested, but definitely looking to see if there’s cheaper alternatives, even if they’re not as powerful, because I can’t commit that kind of cash. frankly, I might be more willing to buy it if they had the lowest option as a free version, so that I got hooked in to using it, but got tired of word count limitation of the free version. they probably have a free TRIAL somewhere, but that’s not what I’m after– I don’t want to be locked out of what I could do during the trial, I just want a very limited free version. Like WoW, perhaps, where up to v 20 you can play for free– there’s very little to DO in the game before that point, and some of what you can do in the subscription service isn’t functional like trading and stuff, but you never have to pay for that very limited capability. I hear you Mica. I’m incredibly disappointed by this move. It doesn’t make a lot of sense given their target market and it’s definitely not something I can recommend to All Freelance Writing readers given the drastic changes. Thanks for this review and the subsequent (updated) comments. I came across the AutoCrit product while checking out the sponsors for this year’s NaNoWriMo. While I’m very interested in all the reports that the software can generate, the pricing really does seem too high. Real-life editors don’t come cheap either, and they’re an additional cost!. Maybe when I’m writing more regularly but for now I’m very hesitant to make such an investment. Thanks again.